In your own words, the Poetry International Rotterdam festival brings together "the most noteworthy poetry of the groundbreaking great masters, alongside that of new and original poetic talents from around the world." It is clear, however, that your mission statement applies mostly to men. 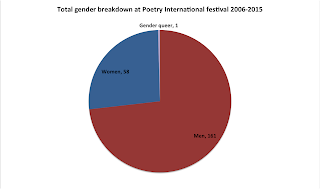 In the ten festivals between 2006 and 2015, only 26% of the featured poets have been women, dropping as low as 16% at both the 2013 and 2014 editions. Looking at the festival's poets from the United States specifically, the exclusion is even more stark. In the last 10 years, only 1 woman has been featured from the US, and only 1 gender queer poet — the remaining 11 are all men. Only 2 of those 13 poets have been people of color. Considering the vibrant and expansive diversity of US poetry today, this exclusion exposes a bias towards a network of the "old boys" — a network which has controlled the infrastructures of the literary community, worldwide, for far too long. This book began for me with the problem of the under-representation of women, particularly in key moments when movements begin to take shape and crystallize and are documented by gatherings, public events and anthologies. And while perhaps few would argue that women are not writing and publishing in [conceptual poetry], it is often at the stage of anthologizing that numbers start to shift so that women are not adequately represented. Like the anthology, the literary festival is a canonizing act. It is also a celebration of writers and one of the few instances when we receive direct payment for our work. The problem of underrepresentation is a problem that your programming leaves unquestioned. At the Poetry International festival each June, the representations of our world’s literatures are best manifested in white, mostly straight, men — that is where your programming choices lie, and that is where your festival money goes. At best, the vast discrepancies in your program denote a sexist curation of the Poetry International festival; at worst, the sum total of a patriarchal, white supremacist, heteronormative culture. That Kenneth Goldsmith is featured at this year’s festival, then, sadly comes as no surprise. Goldsmith’s appearance at the Interrupt 3 conference at Brown University on March 14, 2015, wherein he "remixed" the autopsy report of Michael Brown, cannot be ignored. Michael Brown was an 18-year-old black man shot and killed by police on August 9, 2014 in Ferguson, Missouri. Though Goldsmith claims that he did not intend to enact white-on-black violence, that is exactly what he did. Goldsmith is an exemplar of white male privilege and colonization, and is therefore perfectly aligned with the Poetry International festival’s oeuvre. Poetry International is funded in large part, directly and indirectly, by the Dutch Ministry of Culture. Many of us at Versal are Dutch taxpayers, and Versal itself is a taxpaying entity in the Netherlands. We believe Poetry International’s funds should be directed towards a much wider, inclusive array of poets if you are to fulfill your aim "to present quality poetry from the Netherlands and worldwide to an international readership, encouraging poetry translation, stimulating the international exchange of knowledge about poetry, and facilitating an international community of poetry readers." While we recognize that there are limited financial resources in the arena of poetry, the Poetry International festival’s continued support of those who are already and historically well-funded only serves to perpetuate our community's significant inequalities — and it brings the exclusions and biases of the festival's programming in sharp light. We call on Poetry International Rotterdam to redistribute your public funds to the full array of poets engaged in our art, in line with the Dutch Cultural Policy Act's stated intention for cultural diversity. In addition, we call on you to rectify your festival programming which excludes women, people of color, and the LGBT community in large and unconscionable measure. To personify our concerns, we will not be attending this year's festival, and we invite others to join us in this protest. We hope that this open letter serves as the beginning of a much-needed public conversation. We will count again ahead of next year’s festival, and we sincerely hope to see considerable — not just token — improvement. In 2010, an organization called VIDA: Women in Literary Arts began an annual count of the publication rates of women and men in major literary publications in the US. In 2015, it also began to count women of color. VIDA's findings prove that the center of gravity of the US literary community is on male and white writers. These discrepancies exist here in the Netherlands, too. In fact, in April NRC Handelsblad did its own count and found similarly shocking discrepancies among book reviews in the top Dutch newspapers. Of course, these exclusions extend beyond reviews; they are also found in book deals, publication rates, reading series, festivals, and (public) funding allocations. To deduce the Poetry International Rotterdam festival’s record in this regard, we took a ten-year sample of festival programs from 2006 (the 37th edition) to 2015 (the 46th edition). We counted the featured poets at each edition using Poetry International’s own online archive, first counting women, men and gender queer poets, then counting people of color (POC) and queer poets, referencing online, public information sources where necessary. 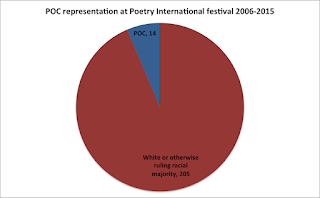 In our count, POC refers to those poets who are a racial "minority" in the country they represented at the festival, such as Arthur Sze of the USA or Lionel Fogarty of Australia. 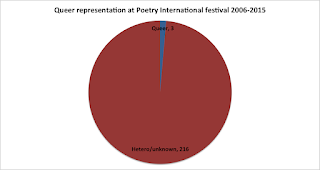 The POC count of the 2006 festival, for which the festival archive is incomplete, was based on internet sources to determine each poet’s country of residence and thus extrapolate the country represented at the festival. We assume that our count of queer representation is incomplete. Our knowledge of openly queer poets is mostly limited to those who live in the USA, and the varying levels of acceptance of LGBT people around the world may force poets to closet themselves for protection. We cross-referenced Poetry International’s poet bios with Wikipedia, personal websites, etc. Relationship status or sexual orientation are not often mentioned in these sources. 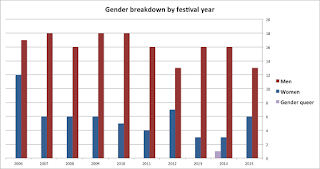 We recognize that there may be errors in this data, but contend that this count serves to expose the exclusions and biases in the festival’s programming.